Richard McKeon’s system of Philosophical Semantics arises from the sixteen pairwise and ordered relations between his four aspects of knowing or cognates: knower, knowledge, the known, and the knowable. These sixteen relations can be sorted in four groups of four elements each: methods, interpretations, principles, and selections. Between knower and knowledge, and between the knowable and the known, arise the four methods of two each: the universal and the particular. From knower to knowledge, the operational method. From knowledge to knower, the dialectical method. From the knowable to the known, the logistic method. From the known to the knowable, the problematic method. Between knower and the known, and between the knowable and knowledge, arise the four interpretations of two each: the phenomenal and the ontic. From knower to the known, the existential interpretation. From the known to knower, the essential interpretation. From the knowable to knowledge, the entitative interpretation. From knowledge to the knowable, the ontological interpretation. Between knower and the knowable, and between knowledge and the known, arise the four principles of two each: the meroscopic and the holoscopic. 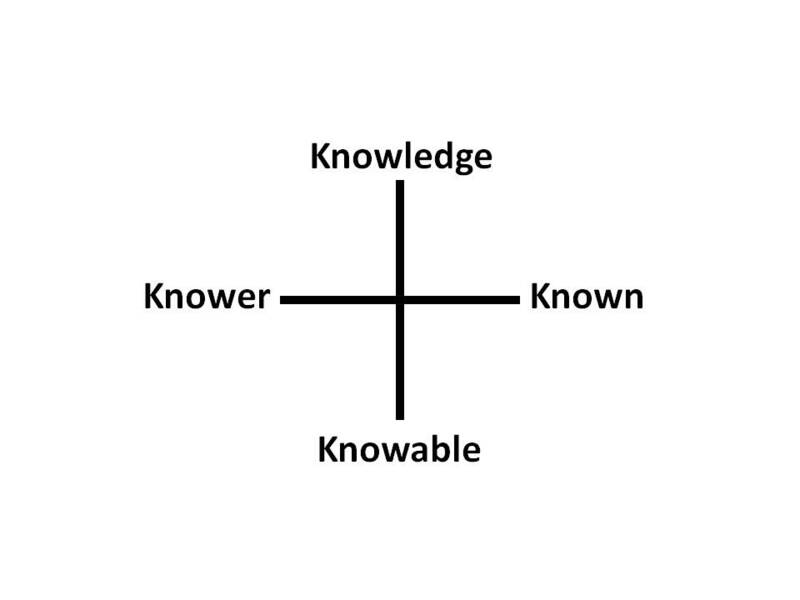 From knower to the knowable, the actional principle. From the knowable to knower, the simple principle. From knowledge to the known, the comprehensive principle. From the known to knowledge, the reflexive principle. Between each of the aspects of knowing with itself, arise the four selections. From knower to itself, the perspectival selection. From knowledge to itself, the transcendental selection. From the knowable to itself, the reductive selection. From the known to itself, the functional selection. Each method can be associated with a discursive process: operational with debate, dialectical with dialogue, logistic with proof, and problematic with inquiry. Each method is also associated with a mode of thought which in turn has two moments and one dependency or assumption: the operational method is debate by discrimination and postulation dependent on chosen theses, the dialectical method is dialogue by assimilation and exemplification dependent on changeless models, the logistic method is proof by construction and decomposition dependent on indivisible constituents, and the problematic method is inquiry by resolution and question dependent on discoverable causes. This entry was posted on January 16, 2011 at 5:28 PM and is filed under Aristotle, epistemology, Philosophy, Richard McKeon. You can follow any responses to this entry through the RSS 2.0 feed. You can leave a response, or trackback from your own site. Would you say that Bergson and Hegel had the same philosophical “stances?” Well, according to McKeon, both had the same semantic profiles (or to be more precise, could reasonably be interpreted to have the same semantic profiles) but had different philosophies. The same could be said for Kant and GE Moore. McKeon, to my recollection, never used the term “stance.” He spoke of the pairings you suggest, rather, as commonplaces. Thank you for pointing out my mistake. I will fix the pages with that claim. I see I went a little “stance happy” on one. I wouldn’t call it a mistake. It’s rather that what you were suggesting seems more like a substantive than a semantic analysis. A substantive analysis is one in which you try to understand what the writer is setting forth as “the truth.” A semantic analysis asks rather what a writer means by key terms such as “motion,” or freedom– without really worrying about his arguments. The pairings which you cite are useful for developing the reasonable possibilities of what one might mean by these terms. For example: is freedom doing what you want whether or not you should, or doing what you should whether or not you please? What sorts of things can be free? Any mechanical body (e.g. free falling bodies)? Only animate beings? Only rational animate beings? Only God? Again these are not substantive positions, but semantic descriptions of what a writer means by key terms and how they interrelate to one another. Once you have figured this out, you are in a much better position to understand the writer’s arguments, and he thinks the truth is. You might also be able to move onto what McKeon called inquiry— in which new problems arise and you expound upon them. I see that you were a student of McKeon’s and a scholar of his work. Thank you for contributing to his web site at http://www.richardmckeon.org if you did so.